The Lake Hodges Station, circa 1920s. Courtesy Pioneer Room, Escondido Public Library. So proclaimed the headline of a huge ad on page 1 of the San Diego Union on Thursday, June 5, 1924, inviting people to enjoy the newly remodeled Lake Hodges Station. Long before there was an I-15, or even a Rancho Bernardo, the unincorporated rural area of Bernardo was connected with Escondido by Inland Mission Road. 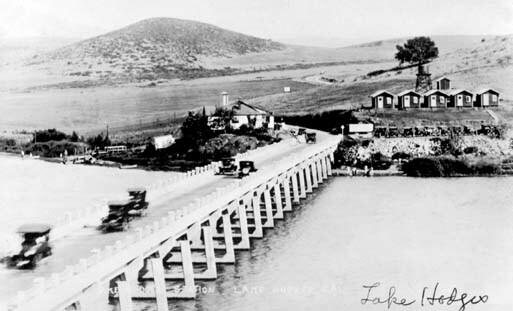 That road (renamed Highway 395 in 1934) crossed Lake Hodges on a bridge erected in 1919. A small general store erected on the Bernardo side of the bridge in 1919 was expanded in the mid-1920s into a restaurant and dance hall. It also became a fishing resort, with a boat dock, cabins and other facilities. A five-piece jazz band from San Diego, “Jordan’s Harmony Boys,” provided the music for the dance pavilion’s grand opening on Saturday, June 7, 1924. The “Harmony Boys” were among a number of featured bands over the years at the Station, also called the Lake Hodges Pavilion. The resort would be a popular gathering spot through at least the late 1940s. The site of the pavilion was covered over when Highway 395 was realigned in 1952. That spot now lies underneath the entrance ramp for I-15 off Pomerado Road. Vista Historical Society presents their Summer Barbecue at the Vista Historical Museum Saturday, August 16, 4-7 p.m. Good food, live music and free silhouettes by Sweet Silhouette. Tickets $30 per person, $50 per couple, $10 for kids 12 and under. For more info call 760-630-0444.